Does your pool look a little pink? Is pink slime infiltrating your oasis? Pink algae got ya down? Pink algae that you find in your swimming pool is actually a bacteria. While slimy, gross & unsightly, pink algae is treatable. Because pink algae is not actually an algae, but bacteria with a pink coating, algaecides and other anti-algae treatments are sometimes inefficient. Though preventing the algae in the first place is the best treatment, here are some other tips for removing the pink in your pool! Brush It Out: Use a pool brush or similar item to brush away the slime from pool sides, bottoms, ladders and other areas coated with the pink algae. Run the filter continuously for awhile to aid in removing the algae particles from the water. 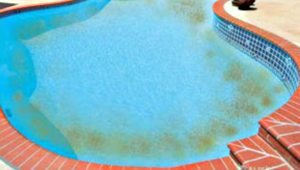 You may need to add clarifier to get your pool color back to normal. Talk to your local pool store or pool professional about how much to use. Run Your Filter Continuously: If your filter has been plagued by pink algae, run the filter continuously until there is no more signs of pink. Then thoroughly clean your filter with chemicals as recommended by the manufacturer or your pool professional. Shock Your Pool: Shocking your swimming pool by adding a large amount of chlorine to it, should aid in killing the bacteria. Keep Your pH in Balance: Especially during a clean out, be sure to monitor your pH levels and keep them at the appropriate level. Sodium Bromide: Add sodium bromide to the water. Bromine is known to be especially effective against treating pink algae. Anti-Pink Algae Products: There are products on the market, used for the sole purpose of killing & removing pink algae bacteria. Talk to your pool professional or local pool store for their recommendation. Don’t let the pink slime get you down. After some cleaning, chemicals, and thorough filtering, your pool will be calling your name once again! Which Pool Cleaner is Right for You? I was searching for good information on algae in swimming pools. Thank you for writing the report.